Charles Haughey, the then-Taoiseach, who arrived in London meeting Margaret Thatcher at 10 Downing Street for talks about Northern Ireland. BARONESS MARGARET THATCHER, Britain’s first female prime minister who was known by many as ‘The Iron Lady’, has died at the age of 87 following a stroke. During her time in office from 1979 – 1990, she had many dealings with Ireland, particularly around the issue of Northern Ireland, leading to the Anglo-Irish agreement. The aim of the agreement was to bring an end to the Troubles in Northern Ireland, but it did not curb the violence or bring about reconciliation. In 1979, Airey Neave, Mrs Thatcher’s spokesman on Northern Ireland, died in a car bomb at the House of Commons which was set by the INLA. Thatcher refused to give concessions to the Irish Republican hunger strikers in the early 1980s, and commented following the death of Bobby Sands that “he chose to take his own life”. A bomb was subsequently planted at a Brighton hotel in 1984 by an IRA member with the intention of assassinating Thatcher and her cabinet. Thatcher escaped injury but five people were killed. 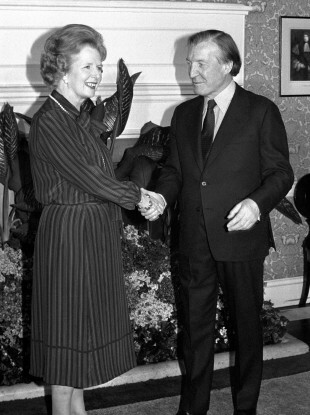 In 1985, Thatcher signed the controversial Anglo-Irish agreement with Ireland’s then-Taoiseach, the late Dr Garret Fitzgerald, at Hillsborough House near Belfast in Northern Ireland. Email “In pics: Margaret Thatcher and Ireland”. Feedback on “In pics: Margaret Thatcher and Ireland”.